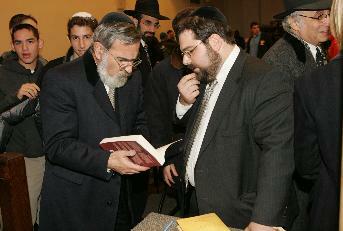 Chief Rabbi Jonathan Sacks with R. Daniel Z. Feldman, looking at the latter's book The Right and the Good: Halakhah and Human Relations. Taken at YU by Menachem Butler. Note R. Shmuel Marcus, grandson of R. Ahron Soloveichik, in the background.